Funko continues to expand the range of video game properties which are being made into POP! figures with the addition of the super-coool, retro sensation that is Pac-Man. Arguably as many man hours have gone playing this classic arcade game since its release in 1980 as any, and it’s still completely addictive today. 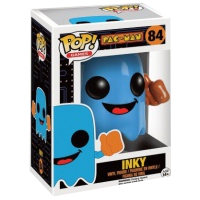 Pac-Man, Ms. Pac-Man and the ‘ghosts’ make a great toy line-up with huge recognition.